Just wanted to drop you a note of "thanks" for the outstanding sculpture that you created for the Elvis Presley Memorial Foundation. 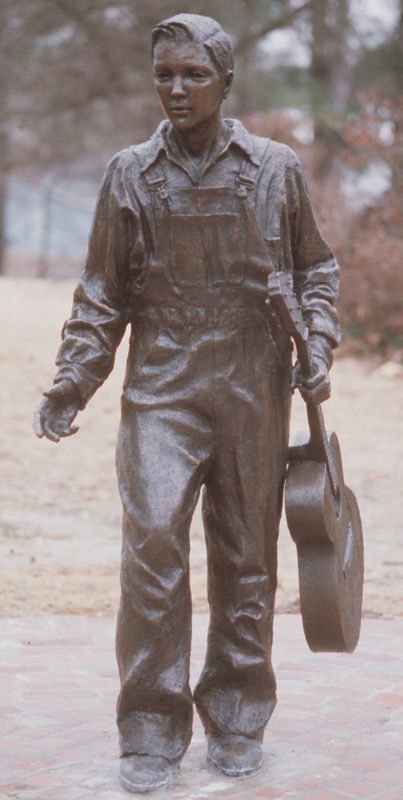 Your sculpture of "Elvis at 13" clearly symbolizes the humbleness and innocence of Elvis in his youth. This was exactly the objective of the Foundation in contracting with you to do this life size bronze statue. You clearly captured the humbleness and innocence that was his essence during his formative years in Tupelo. The high cheek bone features, the nose, the puffy eyes, the ridged hair, all encompassed in the open collared shirt and oversized coveralls clearly showed Elvis's meager background. The Elvis fans that have visited the statue have all been very impressed with its authenticity. It has become one of the top photo ops on the grounds. Just thought you would like to know the positive responses we have received from everyone that has seen your work. You are to be congratulated on your superb sculpting talents. "Michiel works very closely with his clients to capture the exact essence of the subject for which he is commissioned. His ability to create the human spirit from a few photographs is truly amazing. He has definitely earned his reputation as a premier sculptor on a global scale. Michiel cares about his work as well as the people with whom he is working. His skill, patience and kind nature make working with Michiel a very pleasurable and comforting experience". "Michiel has an amazing knack of capturing character, particularly of children. I am mesmerized by how he captured Will's character in an almost magical way. Every detail - from the tilt of his head to the position of his feet - express accurate observation about the boy. I think he has a wonderful way about him - a charm and interest. He is not doing it for the business. " "I received the most beautiful gift I have been given. Words cannot begin to express how much I love and appreciate your work. The beauty and quality of this sculpture is breathtaking. During the holidays we had many friends and family visit and they just stood in awe as they viewed it. It is not only beautiful but represents much hard work and commitment both by the sculptor and the dancer. Each time I glance at it I think of both. You captured her every feature so perfectly. It is truly a very exciting piece of work. It will always be treasured." "Michiel Van der Sommen's sculpture of our daughter Anna has meant more to us than any photograph or painting we have of her. His technical skills are flawless and greatly to be admired, but more than that, he was able to capture the whimsical nature of our seventeen year old. We will cherish his sculpture forever." "The shape, grace and elegance of the figure are just what I had envisioned. You are a master at capturing the beauty of motion." "I become more delighted with the outcome of the sculpture! I have it at my office, and when I have had a frustrating day, I just look at it. It then just gives me a natural high. We are overjoyed." 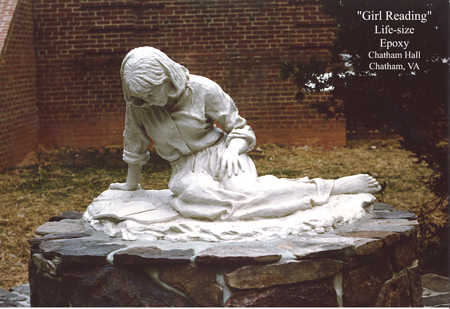 "The culture of the school is enhanced by the magnificent sculpture in the library and on the grounds ("Girl Reading", bottom right), in the rector's home and in the art studio. The sculptor, Michiel Van der Sommen, is a Chatham Hall treasure. "